With the launch of 3D gaming to the mainstream with consoles such as the Playstation, certain genre’s of games were almost wiped out overnight. One such genre was 2D platformers. All of a sudden, with Mario 64, Crash Bandicoot and the rest taking platformers to a whole new level, the traditional run and jump left and right platform was effectively killed off before it’s time on mainstream systems. There were games that tried to relaunch it, and Tombi was one of them. 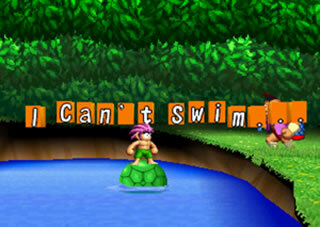 Tombi (Tomba in Japan) was a platformer with adventure aspects for the Playstation. It was the brainchild of Tokuro Fujiwara, who came up with the Mega Man and Ghosts ‘n’ Goblins series. In the game you have to complete a number of missions, that are intertwined with each other to create a completely compelling game. 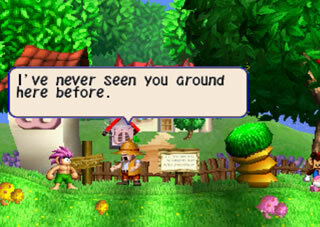 The main goal is to defeat the 7 Evil Pigs, that have transformed Tombi’s world into an area that is dark and bizzare. It’s your job to defeat each of the evil pigs, return the 7 worlds to their former glory, and rescue your Grandad’s Bracelet. The main focus of this game is the missions though. On speaking to people in the game world or by triggering some events, you will get a new mission to complete. Not all of them are required to complete the game but you will get more Ability Points. The more points you get, the stronger Tombi becomes. There are also other reasons for completing missions, such as you get power ups. It’s hard to describe this game. It’s certainly not a platformer, the game’s plaforming elements are not as tricky as something like Mario, and it’s not an RPG in the traditional Zelda or Final Fantasy sense. It’s a mixture of those two, and really it’s probably close to something akin to Super Metroid. Of course, Super Metroid was epic. This game had nowhere near the impact of Super Metroid, but it is no less fun than Nintendo’s offering. It’s a whole different style for the adventure platformer, and is well worth looking for something that loves that sort of game. It’s achieved quite a cult status, as the people who have played it do love it. I hope you become somebody who does soon. I have always wanted to play this game. Nice review, hopefully it makes its way to PSN soon.